Paint is a colored liquid, which dries once spread in a thin layer over a surface. It will leave a thin decorative or protective coating. Paint has many uses, not only decorative, it will protect and prolong the life of natural or synthetic materials. It will protect the surface when it is exposed to a lot of sunlight. In the bathroom it will give protection to dampness. It will make it easy to clean the dust. Additives: can be to make easier to apply, mould resistance, drying quicker. You can understand immediately that for the manufacturing process there is an accurate measurement of ingredients needed. There are different factors which will define the final result. The most important one is the quality of the raw materials, the precise formulations, and the way in which they are combined. Light can influence the result, as well as the type of surfaces, the level of sheen. Paint can be classified as decorative paint or industrial paint. Every paint supplier will have his own color range. Depending on the supplier, the quality of their products and the price range, this color range will be or printed on paper or will be done with the real paint. In any case it is important to see the color in your home in your room. I will always advice the client to buy some sample material and to paint it at home in the room where it will be used. Once you see the color on a bigger surface than just same square cm you will get a better idea of the impact of the color in your room at home, with the light falling in. Color can look different with natural light and artificial light, so take a look as well in the morning as in the evening. It is not easy to choose the perfect color, specialized shops will have people who can guide you. But it will be up to you to come with an idea. Look for some inspiration, prepare some images of rooms you like. It can also be a travel image, a food image. Everything can be inspiration. Eggshell finish: traditional durable paint, low sheen finish, washable. Take care that the surface is in perfect condition: it may be the wall, wood or a piece of furniture. Check on imperfections, cracks should be filled, sanded. It will ask a few minutes or more of your time but the final result depends on this. The most common type of paint used it eggshell, as it is the easiest to work with. The more sheen the more you will see the imperfections. And don't forget to use a primer before applying your paint, as this can be a reason of paint failure. 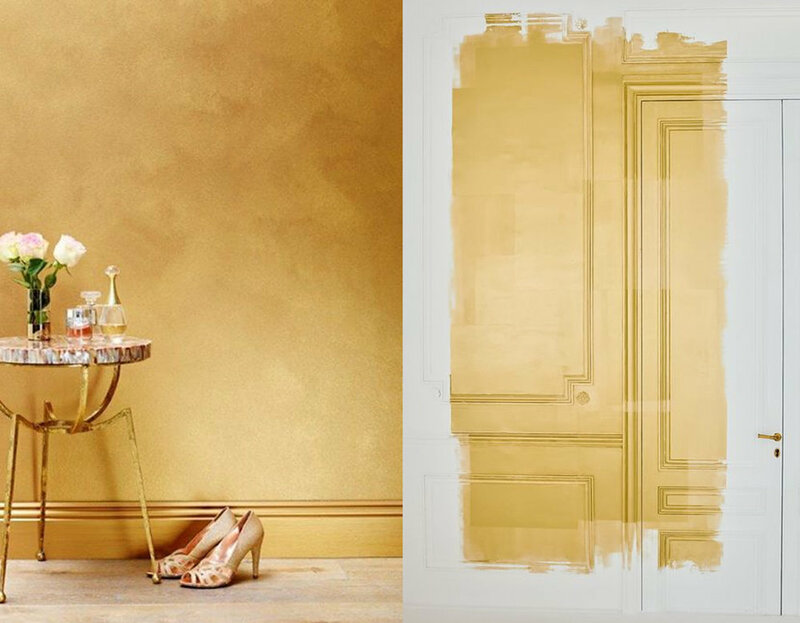 Paint can be a strong tool when decorating your home. A dark color will make the room look smaller, light colors are needed in a room where you will have less light falling in. You can get creative and make your own wall design. I will soon make a special blog post how the use of color can influence the perception of a room, so come back to my blog posts. When we think of paint we see this liquid material in front of us, but it can be much more complicated than that. Special paints are developed including fire retardant, anti fungus, heat resistant: perfect solutions for hotels, restaurants, offices. For a more decorative purpose there are paints with wrinkle finish, fluorescent, crackle finish, structured or metalic finish. And which kid is not dreaming of a wall with chalkboard paint in his or her room. We all know the black chalkboard paint, often used in class rooms. These days they can come in whatever color you can dream of. Special paints are developed for bathroom and kitchen: mildew resistant even under humid conditions. Easy to clean. Paint is also influenced by trends. 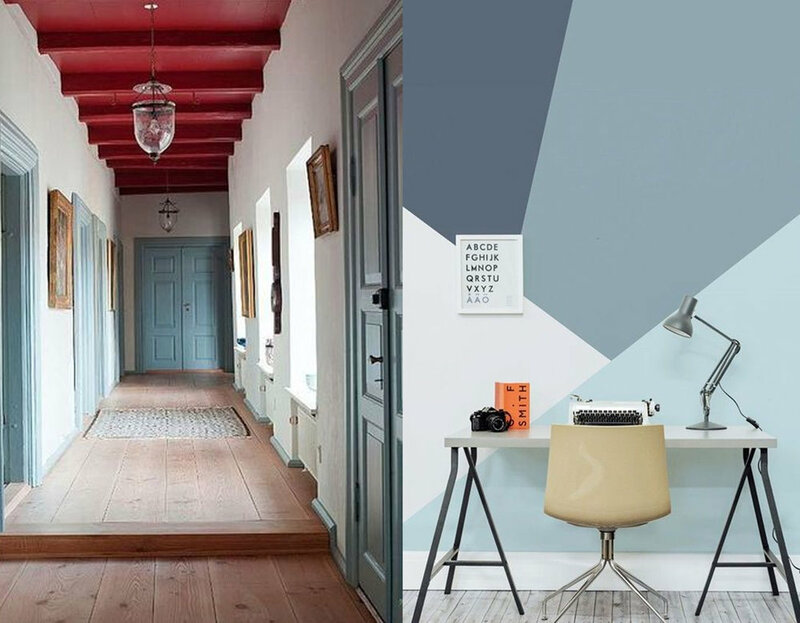 We all have seen lately those amazing ombre walls for interior, which can be applied at home by a specialist or even by your self if you would feel in a creative mood.